We provide Horizontal Auger Boring (Jack and Bore) in NJ, PA (Bucks, Montgomery & Delaware County), Delaware (DE), Maryland (MD) and New York (NY), to diameters of 6" to 48". Auger Boring is the most economical and reliable way to bore under a permanent object. Horizontal Auger Boring, or Jack and Bore, is an established method when installing steel pipes or casing under roads or railways. As with Horizontal Directional Drilling, Auger Boring is a useful option when trying to keep disruption to traffic to a minimum. In heavily trafficked areas in NJ, PA (Bucks, Montgomery & Delaware County), Delaware (DE), Maryland (MD) and New York (NY), this not only makes the Auger Boring process run much more smoothly, but saves you time and money in the long run. What is Jack and Bore? The Jack and Bore method has always been one of the most economical and reliable ways to bore under objects such as established highways and railroads. The Jack & Bore makes this task much simpler, while reducing labor costs and increasing productivity. Generally, Jack and Bore is accomplished with an Auger Boring machine by jacking a casing pipe through the earth while at the same time removing earth spoil from the casing by means of a rotating auger inside the casing. Our Horizontal Auger Boring team is trained and experienced to provide the most comprehensive and safe Auger Boring methods available in New York, Maryland, Pennsylvania, Delaware and New Jersey. At AmeriDrill, Inc. our Auger Boring experience is evident within all of the drilling tasks we complete. This is because we not only meet industry standards, but surpass them by using state-of-the-art Auger Boring techniques and our own Horizontal Auger Boring equipment. Our Auger Boring methods have been used in various terrain in NJ, PA, DE, MD and NY, with steel casing sizes up to 60-inches in diameter. 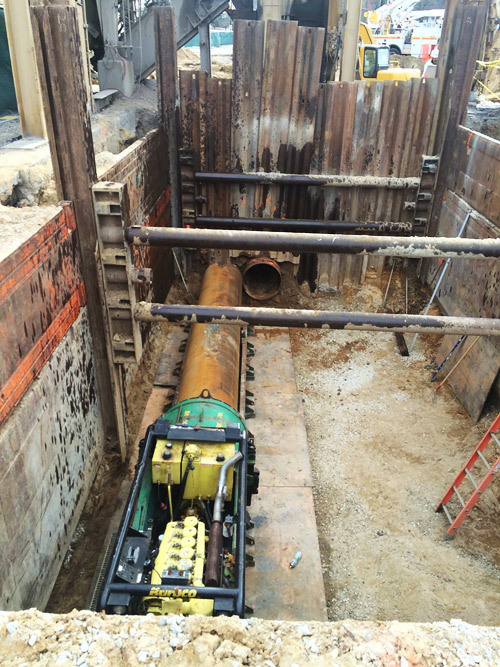 Executing a successful Horizontal Auger Boring project is no easy task; however, with a knowledgeable and experienced Auger Boring company like AmeriDrill, Inc., you can have peace of mind knowing that our crew will be there through each and every step in the Horizontal Auger Boring process. If you are in need of an Auger Boring company in New Jersey (NJ), Pennsylvania (Bucks County, Montgomery County & Delaware County PA), Delaware (DE), Maryland (MD) or New York (NY), contact AmeriDrill, Inc. today.